As I said on my Langkawi Berjaya post: From the very first glimpse, I was in love. Heaven! 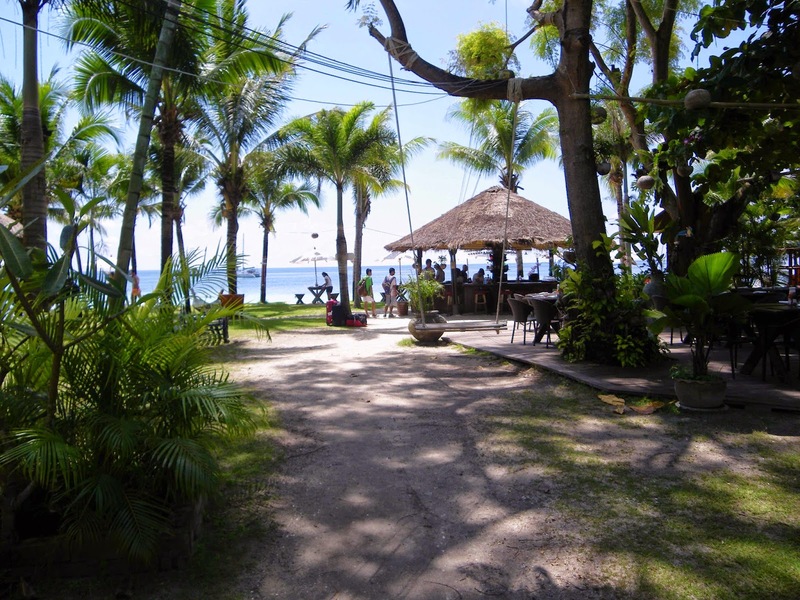 Half-moon shaped, white sandy beach with thatched huts dotted among the palm trees. The sea was so clear you could see fish as clearly as if you were swimming with them. The water was a brilliant shade of aquamarine. At each end of the beach rose a rocky headland. Sure we’d been to some gorgeous places around the world, but this ranked right up there. Given, Thailand is maybe my favourite country on Earth. Koh Lipe may just become my favourite place in Thailand. Arrival was nothing more than organised chaos. A table was set out in the sand as you hopped off the longtail boat that transferred you from the landing platform 50 metres to shore. You stated your name and nationality and were marked off a paper, handwritten list. Then you wait under a tin shed like building with a handful of chairs, while tuk-tuk taxis and hotel staff looked for their appropriate passengers. Then, in no particular order, names were called and you collected your passport, confirmed your return trip back on the ferry, then headed to your resort. Mali resort was near the northern edge of the beach. We had a beach facing bungalow that I would have happily moved into and lived in for as long as the hosts would have me. Instantly I knew I’d made a mistake – only booking 2 nights not 12 or 1200! Ruth, the manager, informed me that there was vacancy if we wanted to extend. But alas, I had already booked and paid for the hotel back on Langkawi. Ah, next time, I must follow my own golden rule – no less than 5 nights in each place. One thing that was stinkingly different from Langkawi was the heat. It felt much hotter and more humid too. The sun seemed stronger, or maybe it was the blinding white beach. J and I enjoyed a cold drink with some sandwiches for lunch and relaxed a while before walking up to the main town area of ‘Walking Street’. It seemed almost deserted, with only a few surfer dudes grabbing a drink or snack. We did make an exciting discovery, a Mexican restaurant called ‘Aroy’. Hmm, dinner plans were sorted (for those that aren’t familiar with our previous trips, J and I have a tradition of finding Mexican restaurants where ever we travel). The rest of the afternoon was spent in the impossibly clear, blue water. Just a few metres from the shoreline, large parrot fish and other smaller colourful fish were going about their business of chomping coral and swimming about. Out further a hundred metres or so, there were some great outcrops of hard corals and some softer corals closer in. 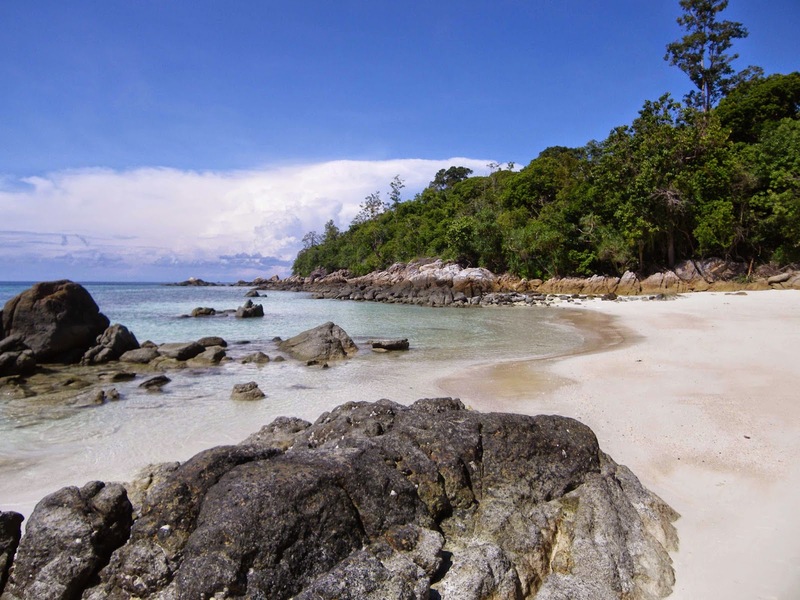 Sure, it wasn’t Sipadan, but it was as good as the Surin islands off Khao Lak, but in fact better as you could simply walk into the water from the beach, directly in front of your hotel. I truly felt in heaven! Showered and refreshed by a beer at the hotel beach bar, we set off to Sunset Beach. Though only a kilometre or so away, the path was up a steep hill. Already tired from the day swimming, we really didn’t need the extra exertion. Thick cloud on the horizon obscured what would have been a lovely sunset. 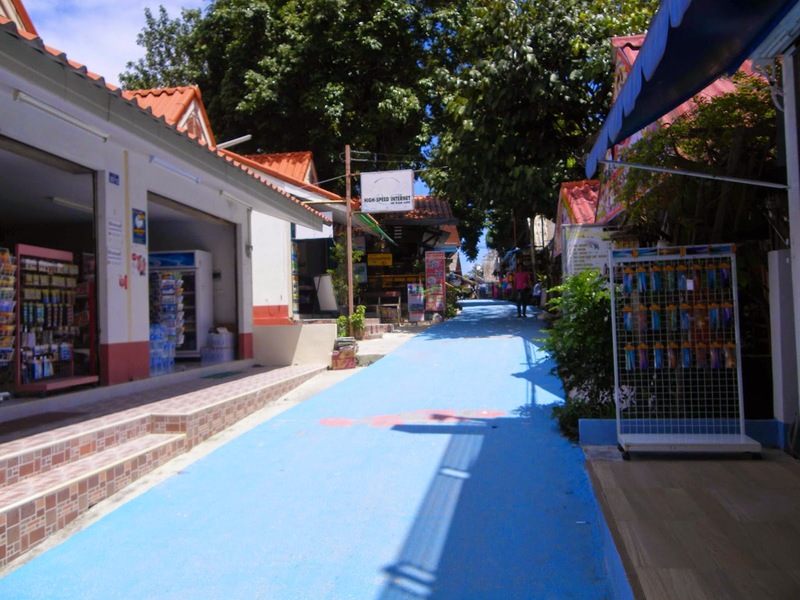 A concrete road meandered along the spine of the island over some undulating hills to town. Dinner at our predetermined Mexican restaurant was really good with delicious fresh salsa and tasty chimichungas. The town had come to life once the sun set. Many restaurants were open serving a steady cliental. A few stalls had popped up selling the usual touristy wares. 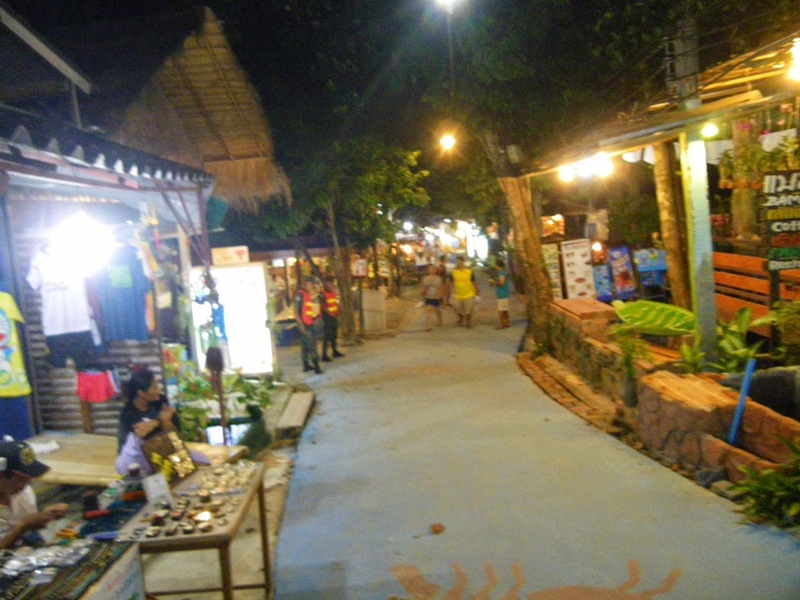 The narrow ‘Walking Street’ path was busy with many people browsing shops and finding places to eat. A slightly mad looking Greek guy was singing enthusiastically as he grilled lamb and chicken over hot coals, hawking souvlaki. Deeply tanned, he was bare chested with long hair dripping down his neck that looked as if it had never seen a brush or comb. Picking up some cold drinks on our way home, the night was in full swing with many people dining and drinking. We walked back along the beach where a few beach bars had set up little tables and cushions in the sand. Though inviting, we were too tired to stay out much later. A night cap on the balcony of our little bungalow was the most we could manage before falling asleep with the sound of the ocean in our ears. Up early, we mooched around the hotel after breakfast. We considered hiring a long tail to take us out to some other snorkelling sites, but we were too lazy and instead resolved to snorkel off the beach but further around towards the headland. We waited for the tide to come in before heading out and snorkelling for a couple of hours. We saw some interesting fish and the corals were OK. The main hazard was boat traffic nearby, so we made sure we made ourselves visible whenever we heard the buzzing of a propeller. Hungry, we returned for lunch and rinsed off. From where we’d snorkelled, we had spotted a little cove just over the headland at the end of the beach a few hundred metres from the hotel. Keen to explore, we headed off on foot. 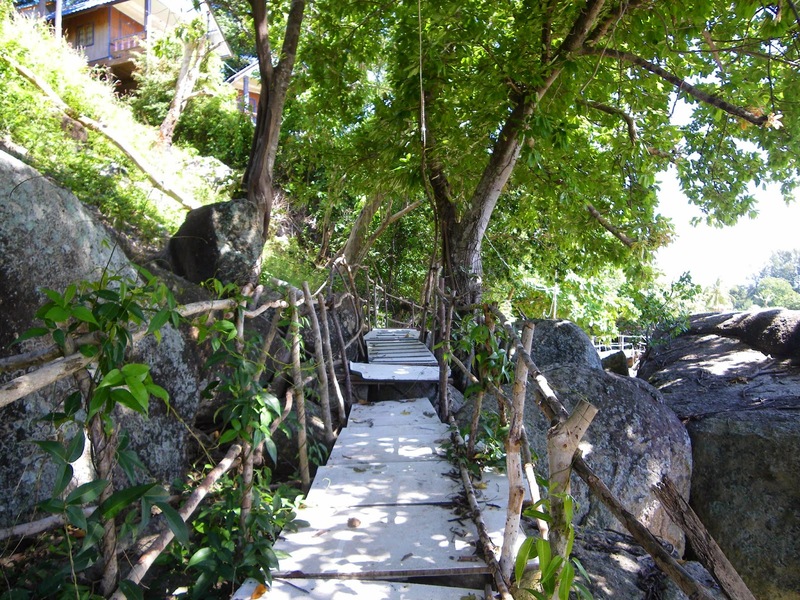 A rickety walkway over the rocks had been constructed from bits of timber, left over boat panels, tree branches, doors and other scrap. It felt like a little adventure walking a gang-way like path, until we reached a deserted resort of cute bungalows perched on the hillside. On the other side was another tiny white sandy beach. 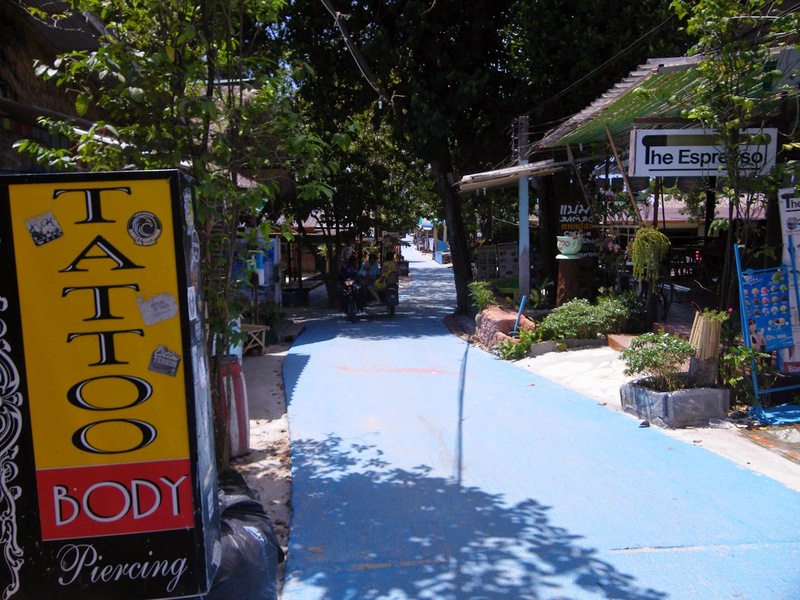 Like a secret hideaway, the small resort felt very rustic and isolated, though only a few hundred metres away from the main stretch of Pattaya beach. 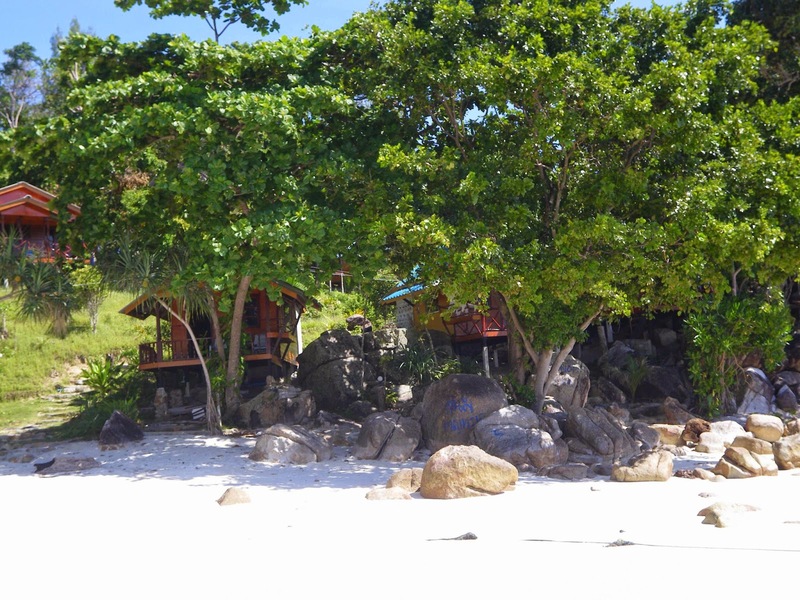 Still ruing not booking more nights on Lipe, I was keen to see the other main beach area of Sunrise beach. So I dragged poor Mr J away again for some more walking. Straight through town on Walking Street, we quickly reached the back beach. Instantly I was so glad I chose to stay where we did. 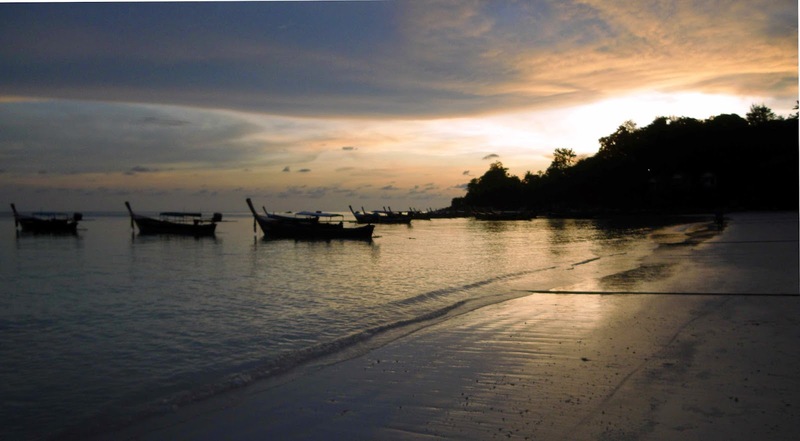 Sunrise Beach wasn’t as white or as wide, but was packed with many, many longtail boats, mostly local fishermen. Some lovely resorts and bungalows lined the shore, similar to Pattaya, with more greenery. The soft sand made for a taxing walk but pleasant to see a different view over to the nearby islands. It would have been a shame to have left without seeing more of the island. Our last night was on October 31, Halloween. Many signs were out advertising parties and functions at the islands various bars and restaurants. Back at the resort, some staff were talking about going to a party. J and I were not keen on partying, but we did head out for a drink and dinner to see what was going on. We watched sunset from a beach bar and had a lovely Thai meal at a beach restaurant with our bare feel in the cool sand. 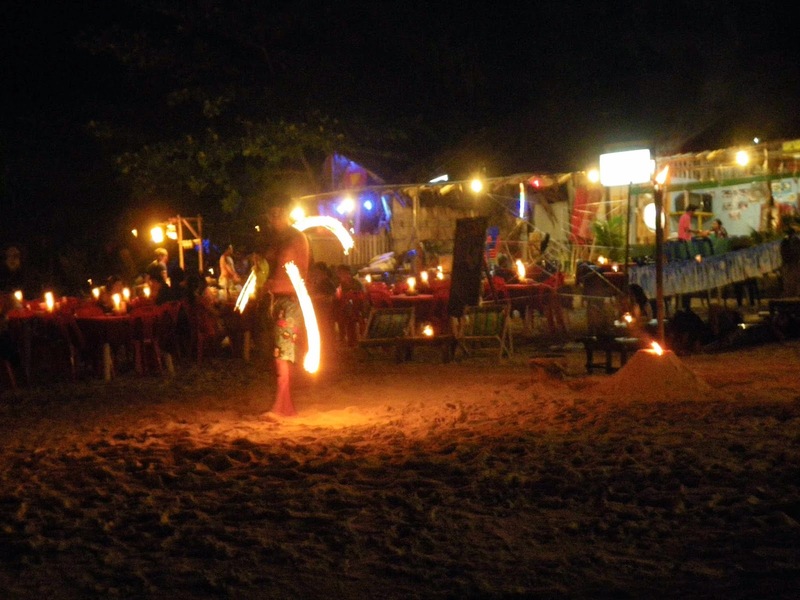 Dancers on the beach twirled fire sticks and spun fire balls drawing a crowd. Sand sculptors had created a jack-o-lantern lit up with candles. Fake spider webs, bats and spiders decorated roofs with a few carved pumpkins on doorsteps. There was a party atmosphere everywhere. J and I simply grabbed a few beers and headed back to the resort. Had we decided to stay even just a few more minutes, we would have been caught in a torrential downpour as a large thunderstorm suddenly come in from the other side of the island. 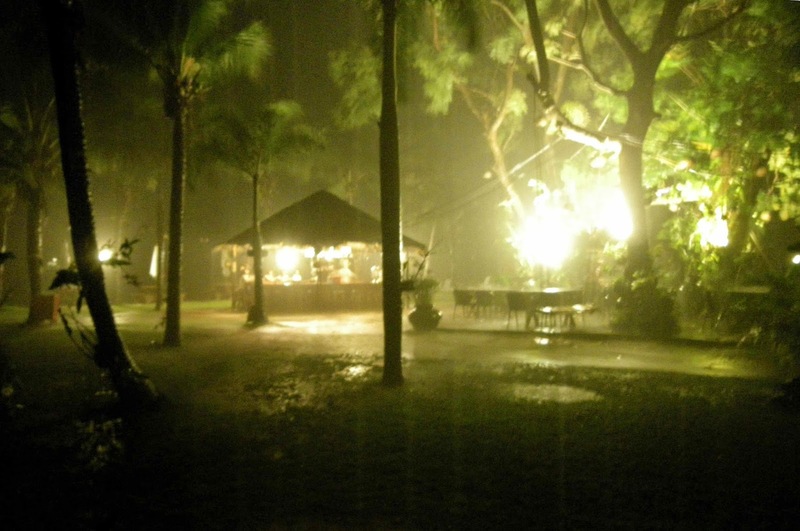 Large drops were falling on us as we walked through the resort’s garden to the bungalow. By the time we had reached the door, rain was falling in sheets as bright flashes of lightening and loud crashes of thunder hammered the island. At the beach bar, a group of people were stranded as the rain, incredibly, came down even heavier. J and I sat on the porch with our drinks, enjoying Mother Nature’s spectacle. At one point, the beach bar’s lights went out, probably shorting in the rain. We could hear the group laughing and yelling, enjoying being marooned. Half an hour later, the rain eased and they wondered off letting the bar staff finally close up. The following morning, we met Ruth over breakfast, who told us stories about people being caught in the storm, along with party shenanigans and handovers. She insisted she had stayed home, but wouldn’t take off her sunglasses… It was our last morning. The ferry back was due to leave at 4pm but we had to go and check in at 1. Fortunately we could enjoy our room until two. We had a last snorkel before packing and getting ready to leave. Until it was time to leave, we relaxed around the beach bar, chatting with other guests and wishing we didn’t have to go. I knew I’d return and was looking forward to exploring Langkawi too. Read Your blog. Thank you so much for sharing your experience. 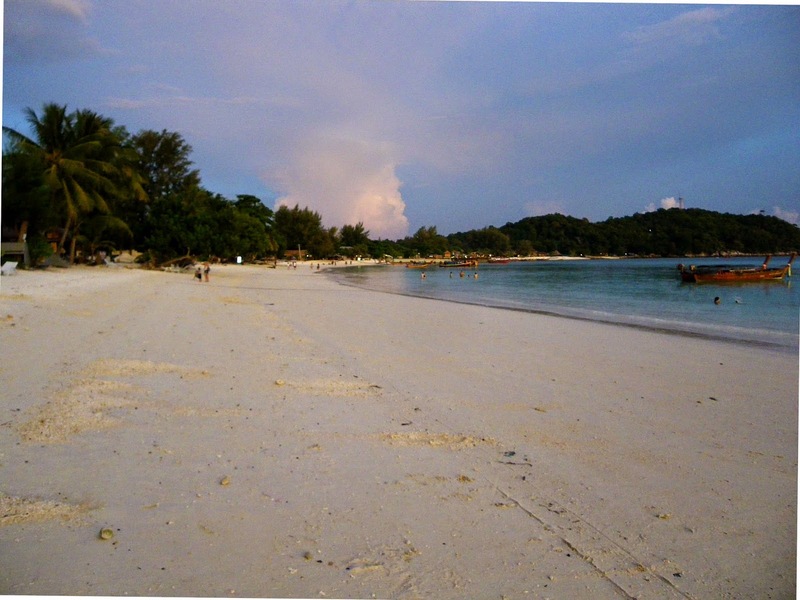 I with my husband are planning to go to Koh Lipe from Langkawi. Please guide us how You booked the ferry for Koh Lipe. Do we need to book it in advance? 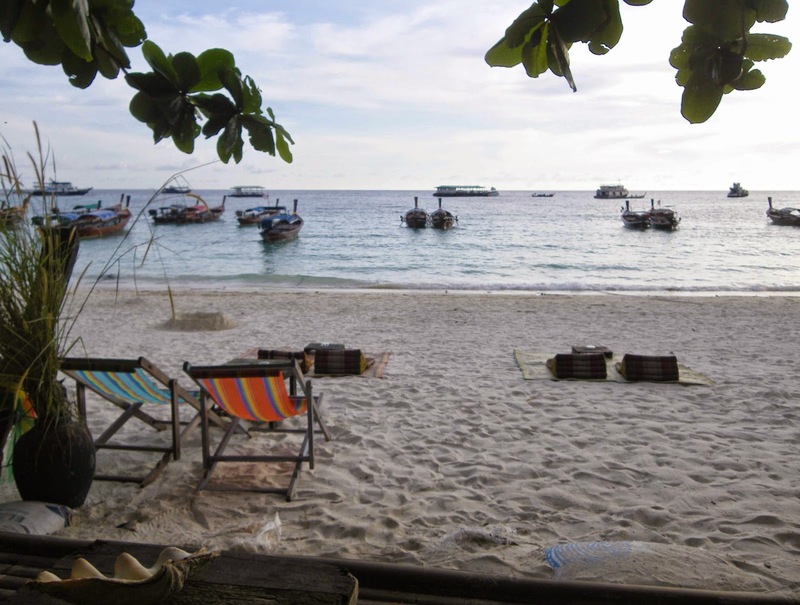 Would March be good time to visit Koh Lipe?